The medical industry is constantly looking for ways to provide better care. Current advancements in technology are now allowing organizations to improve their practices in remarkable ways. Let’s take a look at why healthcare organizations should consider a digital transformation. Lately, hospitals and clinics have been adopting a telemedicine approach, which refers to the ability to provide healthcare services to patients remotely. This approach expands access to healthcare for patients who may be in different time zones and even those on different continents. The technology is especially useful for helping patients located in remote areas where it’s challenging to find quality healthcare. With telehealth, a patient could work with a renowned cancer specialist without having to fly across the country to meet them. Using the right technology, a local doctor can connect with the specialist to ensure the proper treatment begins as soon as possible. Telemedicine also makes treatment more affordable since healthcare organizations won’t have to spend as much money on travel and the transportation of medical supplies. In addition to remote care, there are mobile applications that allow patients to monitor their health. For instance, an app can help a patient with heart disease to record their vitals or remind individuals with diabetes to take insulin. Such notifications can reduce the number of hospital visits, which saves a lot of money for healthcare organizations. All in all, telemedicine is the way of the future for hospitals, helping to ensure that every patient, everywhere, gets quality treatment. However, in order to implement this approach, healthcare organizations need to undergo a digital transformation. Big data is a way of extracting insights and patterns from data sets that are too large for the average data-processing software to handle. In healthcare, big data is being leveraged to better manage treatment plans. Hospitals and clinics can use data from wearable medical equipment and DNA analyses to create unique profiles for each patient. The technology can learn about the patient’s lifestyle while comparing it to other patients with similar attributes. Having all this data readily accessible assists doctors in determining the right treatment strategy. Big data can also help professionals understand the biology of certain illnesses. The technology amasses every piece of data regarding a disease’s composition, including the DNA, organs, proteins, tissues and more. With this knowledge, big data can build optimized patient profiles and predict ways to treat their ailments. If you’ve ever been to a doctor’s office to get blood work, a biopsy or a scan, chances are you’ve had to wait a while for the results—sometimes for weeks. In fact, it can take up to 48 hours just to get blood work results. Not only can long waits be nerve-wracking for patients but treatment could also be delayed. And delayed treatment can sometimes be fatal. That’s where artificial intelligence comes in. The technology improves body scans and other services by working with deep learning methodologies that allow machines to recognize text or images. With these technologies, the platform can analyze CAT scans up to 150 times faster than a human radiologist could and can detect acute neurological events in only 1.2 seconds. This means that patients get accurate answers on the spot, reducing the wait time to minutes. Artificial intelligence in healthcare can also provide insights into how to create better pharmaceutical products. Such advancements pave the way for speedier trials and better medicines in the future. Is it Time for a Digital Transformation in Healthcare? If you want your healthcare organization to stay successful, consider getting started with a digital transformation. By moving your operations to the digital realm, you will be able to lower patient costs, reduce hospital expenditures and improve patient treatment paths. A digital transformation will allow your healthcare organization to reach new levels of efficiency, accuracy and efficacy. Ready to take the plunge? The first step when implementing a digital transformation is selecting a developer. 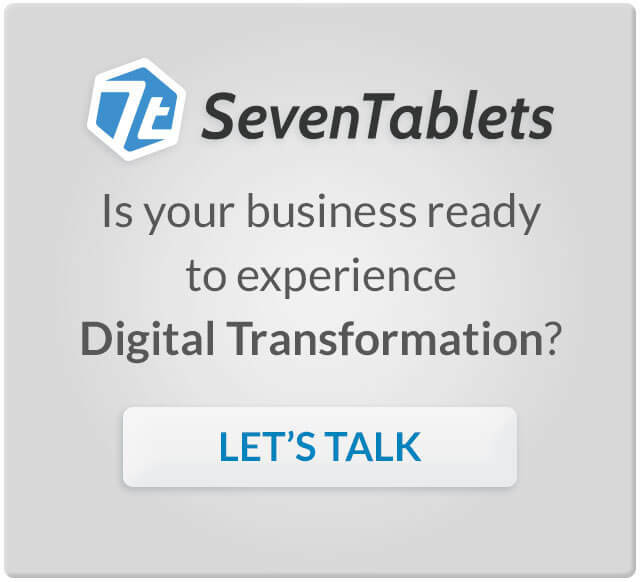 At SevenTablets, we are happy to walk you through every step of a digital transformation. We can develop custom mobile apps, help you refine your mobile strategy and optimize your security. In addition, we provide services related to a host of emerging technologies, including Internet of Things, predictive analytics, artificial intelligence and augmented reality. SevenTablets is headquartered in Dallas, but we also serve clients in Austin, Houston and beyond. If you’re ready to discuss your digital transformation, contact us today.